@Kylo Rey wrote: A bit off topic, but the Golden Globes nominations were just announced, and Adam Driver is now a Golden Globe nominee! He is very likely on his way to his first Oscar nomination! That is so awesome! Congrats to Adam! Well deserved... It was coming sooner or later.. He wasn’t impressed with TLJ so I can’t imagine him getting misty-eyed over something outside the usual fanboy checklists. I haven’t listened to his review of TLJ since it came out so I might be misremembering on that. It seemed like he wasn’t into reylo or didn’t see it as potential or actual romance. 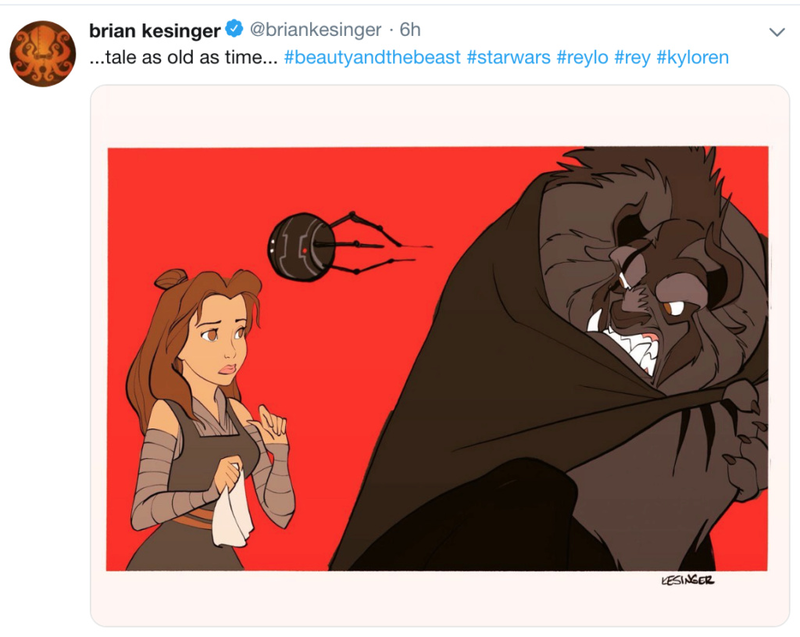 I don’t think he sees redemption for Kylo, either. I know he’s been a defender of the prequels so it was probably unfair of me to label him as just an OT fanboy. I seem to recall he was disappointed with how TLJ handled Luke and thought he should have actually gone to Crait. I get it, though. It’s been a long dry spell and people are hanging on for any scrap of info. We will doubtless get more of this kind of hyperbole in the next 12 months. It keeps the hype going but tells us nothing of consequence. Of course he's going to hype an upcoming movie. He's not going to go out there to the media and say it's so-so or something. Re: TLJ script, I found it interesting that even the script seems to give no insight into Rey's hut vision. It makes me wonder if Rian himself actually gave any real thought to what Rey saw when she touched hands with Kylo. The less charitable view would be that Rian simply needed to come up with a reason for Rey to go to the Supremacy and he didn't think beyond "Rey saw a vision" as the explanation. Or he simply didn't want to lock the story into a particular outcome and left the future resolution entirely up to the next writer. 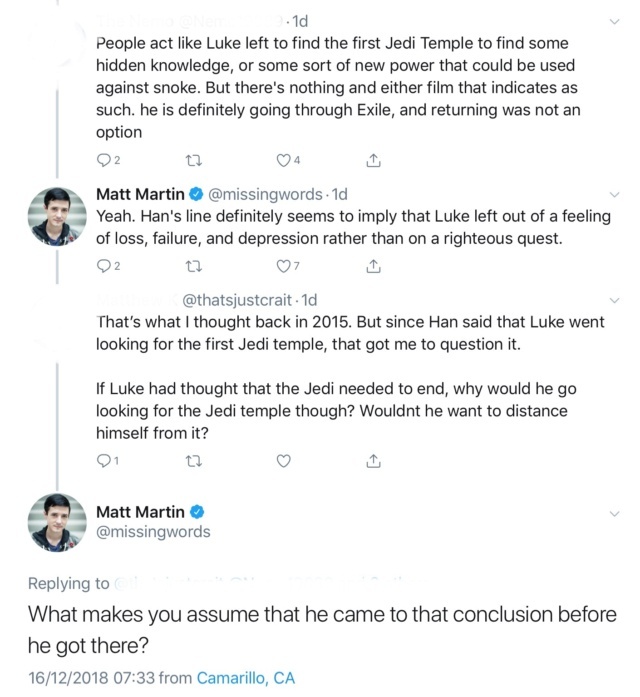 Considering his non-committal response to his own resolution of Rey's parentage, like it's still up to the next episode to confirm or deny, I think the latter is very likely. At the very least, I think we can rule out the idea that Rey's vision had anything to do with the Throne Room. Otherwise there's absolutely no reason not to mention it in the script. 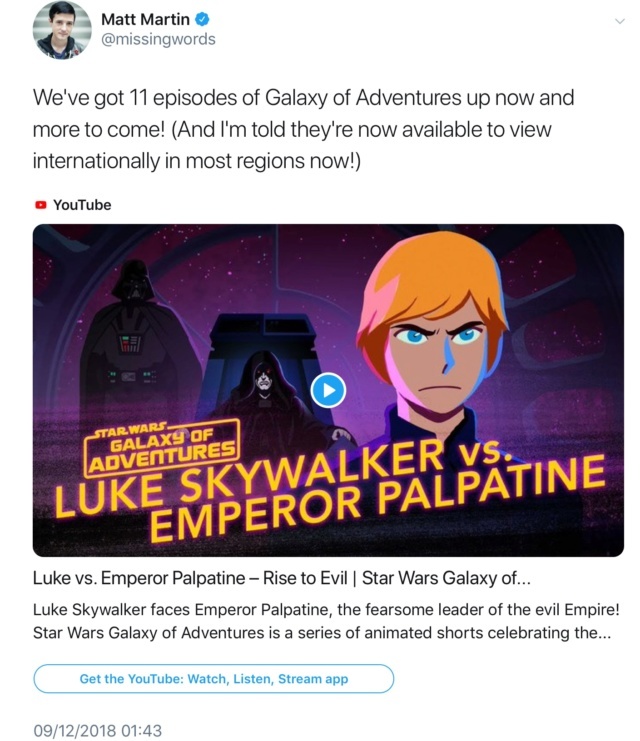 @Saracene Yeah, it's definitely not about the throne room, what happened there only served to (briefly) foster her hope that her mission would be successful and the vision was correct. They may not have had the specifics outlined because they didn't shoot the scene, but I think of it as a form of foreshadowing, i.e. Rey's vision showed her the future they could potentially have together if Ben comes back (she said "I saw his future"). I assume JJ might finally show what she actually saw in IX or just confirm it through the plot. 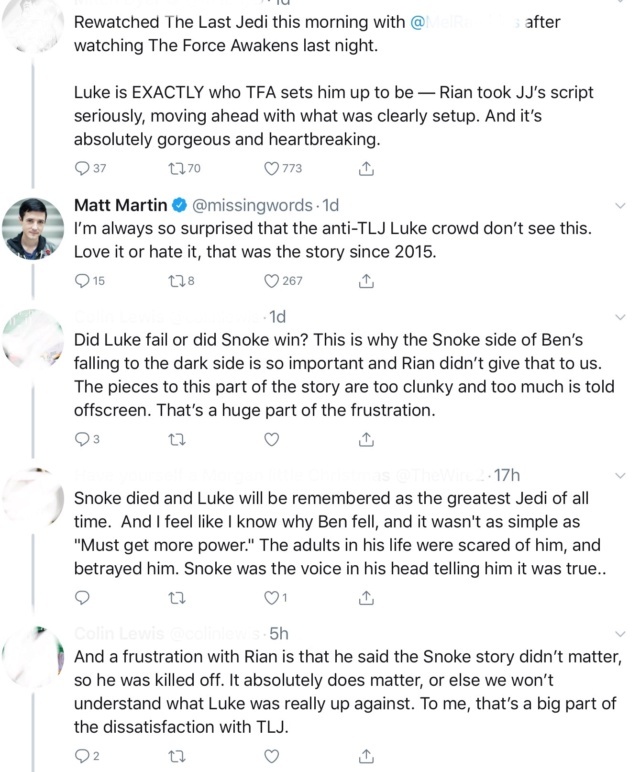 In any case, in the broadest sense it's sth related to his salvation/redemption and it'll come true, TLJ just wasn't the right time. 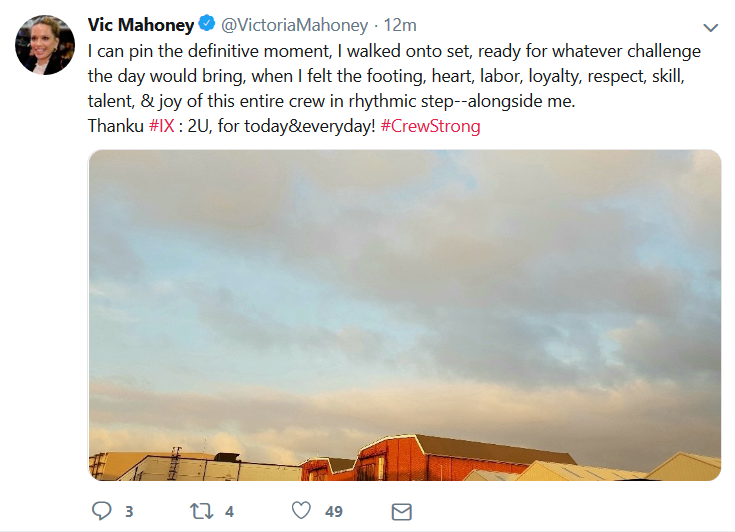 Chances are it probably featured Rey in some way as well to add a personal motivation. That said, I don't think her actions are solely based on a vision we don't even get to see. The official reasoning is "the good of the galaxy", but the real reason is the emotional connection she established with Ben over the course of their Force sessions. Whatever she saw obviously had a very strong effect on her seeing how she gasped and then passionately pleaded to Luke, but it was also the realisation that she can find belonging with Ben. She didn't want to let go of what they had, he listened to her, she started understanding him and discovered a broken soul not unlike her own. The core implication of the vision the way I understand it was she recognised his potential to be good. The parallels are certainly there. Even the prince's name is Adam. Coincidence? (Probably) I think not. Rian is so incredibly detail-oriented about literally every other aspect of his films, that would seem like a major omission. There's no way he's going to put a massive spoiler in a script going public for all the world to behold. The social networks have posts from the TLJ premiere about a year ago; therefore, ~ a year from now, we will probably be discussing, and admiring the photographs of Daisy, Adam, Kelly, John, etc from the IX premiere!! Just a heads up for the UK peeps: ITV are showing TFA as their big end of year film on Sunday 30th December. This is the terrestrial premiere. The first one is “what? ?” I hadn’t noticed. Sorry, double post. I was angry when I saw I could not watch them but indeed, since this WE, they are available in Germany too. Very short but so cute. I had this country problem too (and I was angry to have a country lock to watch those videos) but I discovered you can watch them on sleemo's site when this happens. Thanks to this solution, I could see Lego all stars and Galaxy of Adventures. @ScripttoScreen just uploaded the “Join Me” scene! Happy first birthday to TLJ, the film that unlike most blockbusters might never go out of the public consciousness and discourse. 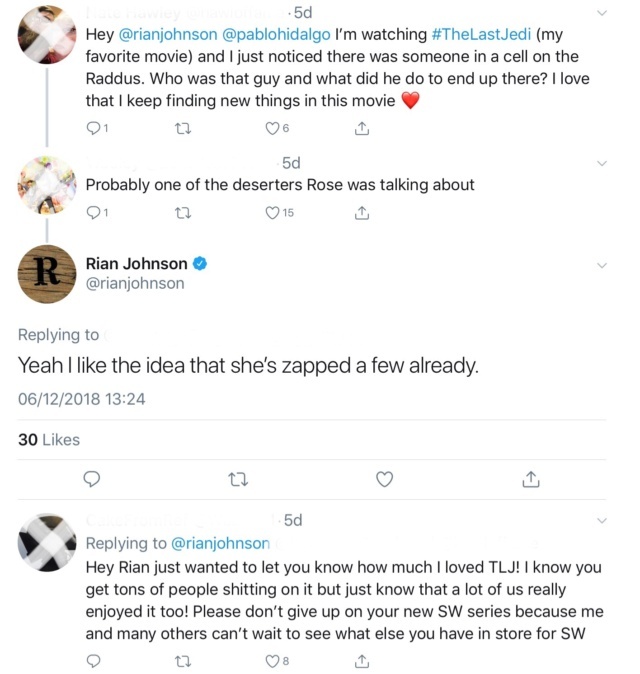 Edit: As Rian himself has said, most of the feedback is nice. My post has over 80 likes, including one user I recognize from here. Just went onto Rian’s twitter account and the balloons popped up, the message you get when it’s the user’s birthday. So happy birthday to this real life human teddy bear who is a complete gentleman and who delivered one of the most bold, visually stunning and ambitious Star Wars films with a beautifully acted relationship at the centre of it. Happy birthday Rian! 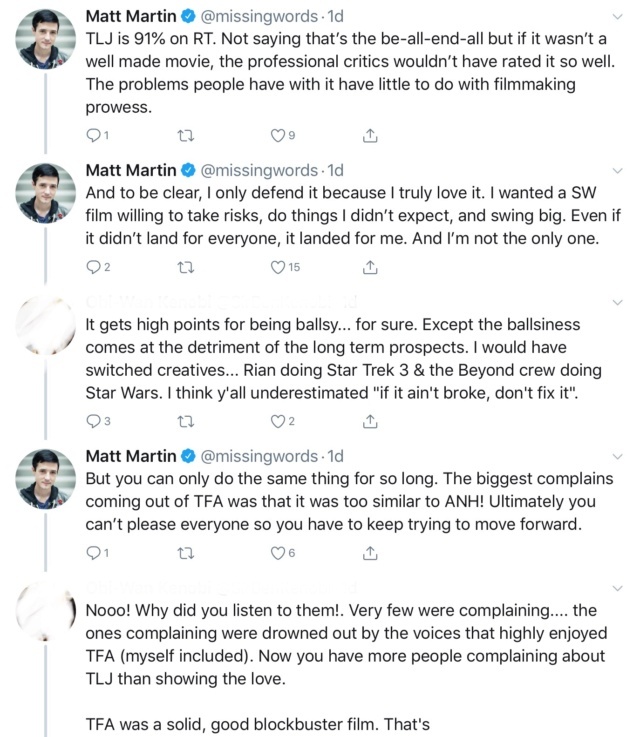 Matt Martin is on fire to defend TLJ. Gotta say, the guy is patient. Long post with screenshots, sorry. I’ll go sit down in a corner with Matt Martin. I’ll take TLJ over TFA any time. And food for thought - or not. @SanghaRen that last tweet is pretty impactful when you think about it! OMG!!!! 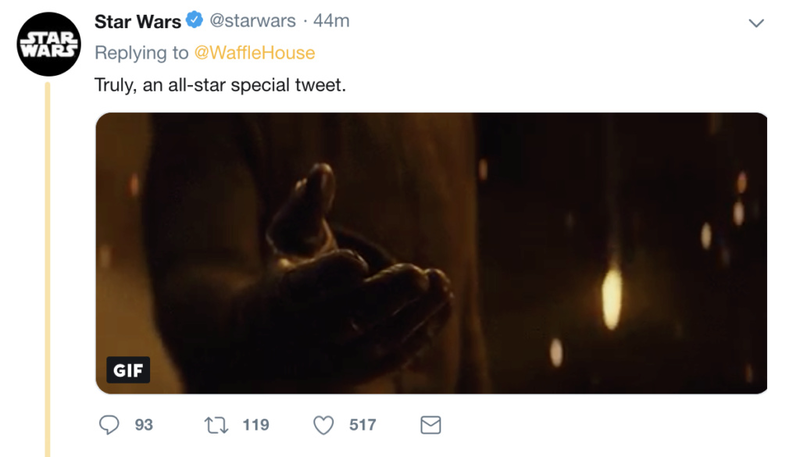 (Visits Twitter to heart both, and begin following Waffle House). That’s awesome. 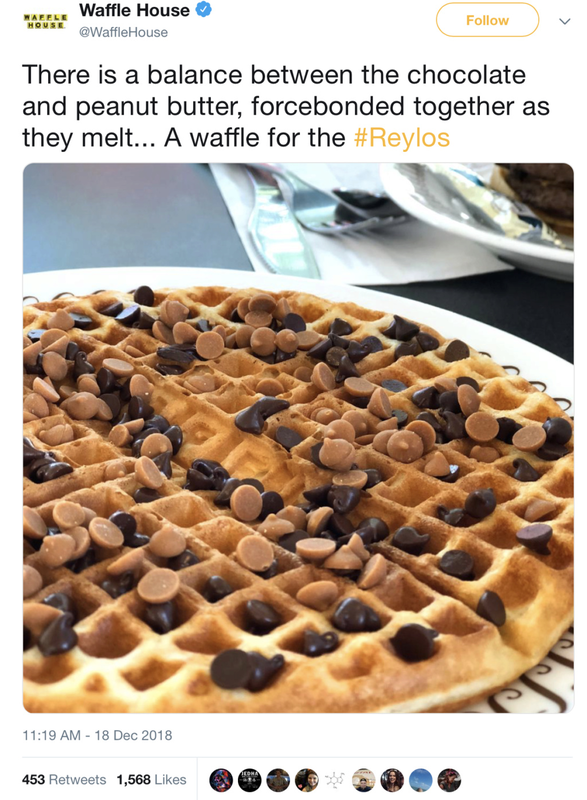 I haven’t been to Waffle House in years, but when I go again, I’m so asking for the Reylo waffle. LOL. I just noticed that Capri Sun got in on it too. LOL This is too rich....I LOVE IT! if neither of them are not involved with marketing campaigns for IX next year....I will be very very shocked. All of this is just... AWESOME.. Great way to start the campaign for IX!